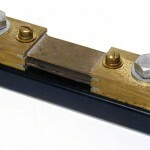 Motorhome and Caravan Info Australia » Blog Archive » What is a Shunt and why do I need one? A shunt is often listed as an optional extra when you buy your solar regulator. 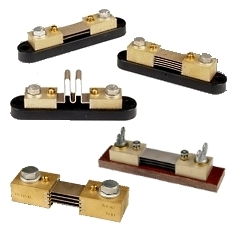 Plasmatronics sell theirs in two parts – the shunt and something called the shunt adapter. In my experience very few people understand the function of this device and more importantly why it is an important part of your motorhome or caravan solar setup. From this photo of a shunt you can see that it is a fairly simple device, no moving parts and no electronics. How can this lump of brass actually perform any useful function? Simply put, a shunt translates “current flowing” into a voltage signal. The voltage produced by a shunt is exactly proportional to the amount of current flowing through it. For example if 10amps is flowing from your solar panels to the battery (through your shunt) – this will produce a voltage of 1 millivolt at the small terminals of the shunt.. The same shunt will produce 2 millivolts when 20 amps is flowing through the shunt. This same setup will produce negative 3 millivolts when the batteries are discharging (at night for example). This is a really useful thing when it comes to reporting what is going on with your solar power and battery system. We could of course measure the current directly (with a ammeter)– but to do this we would need to use heavy cables (capable of carrying the load and charge current) all the way to and from the measurement device. It is far easier to run tiny wires to carry a voltage signal that is proportional to the current; then just measure this voltage. When is a shunt required? If you want to accurately track the state of your batteries (how charged they are), the best way to do this is to count all the energy that is removed from the battery and count all the energy that is added (by the solar panels). This involves measuring the current flowing in the wire going to the battery. Remember – a shunt cannot report energy that it does not see. This is one of the most common mistakes I see in motorhome and caravan wiring. If your system has a shunt, one side must be connected DIRECTLY to the battery terminal and there must be NO other cables attached to that battery terminal. 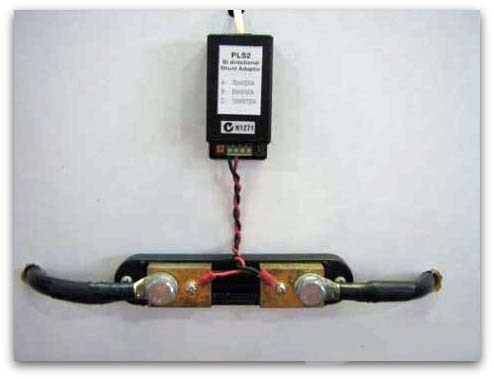 To attach cables to the battery terminal that the shunt is connected to is to by-pass the shunt. The PL40 solar controller can measure and track a small load directly (without a shunt) when it is attached to the load terminal. This terminal is only rated at 5 amps (20 amps on the PL20). Thus, if you need to measure the current being used by larger loads (inverters etc) you need to fit a shunt. The state of charge (SOC) display on the PL series of regulators is meaningless unless a shunt is correctly fitted. Shunts are rated with two sets of figures written as “200A = 200mV”. The first number is the maximum current that the shunt can handle – this is typically 100 or 200 amps. The second figure tells us how much voltage will be produced when the shunt is carrying this maximum current. So a shunt marked 200A = 200mV will carry a maximum of 200 amps and when it is doing so, it will produce 200milli-volts across the measurement terminals. It is important to make sure that the regulator is expecting to see and understands how to read the voltage that your particular shunt produces. The shunt adapter supplied as an optional extra for the PL series of regulators has three settings that allow it to work with most common shunts. Some tips in installing your shunt. Make sure you are using the correct shunt for your setup. See the information that came with the regulator. Make sure you do not exceed the rating of the shunt – it will get very hot very quickly. Be absolutely sure that ALL the current (both from charge sources AND discharge sources) passes through the shunt. It cannot measure what it can not see. Some regulators require the shunt to be installed in the negative battery cable while other regulators require the shunt to be installed in the positive side of the battery. The Plasmatronics PL series do not have any preference. Consult you manual – getting it wrong can damage the regulator. Got a question about shunts? Had an issue with a shunt – why not tell us all about it? We would love to hear from you. Use the “Leave a reply” box below this article or contact us by email. This entry was posted on Wednesday, September 15th, 2010 at 7:40 pm	and is filed under Caravan, Electrics, Motorhome, Power, Solar. You can follow any responses to this entry through the RSS 2.0 feed. You can leave a response, or trackback from your own site. When you connect batteries in series or parallel – they look and act to the system like a single battery. So for this reason, the cables that connect the batteries together can be ignored (from a system point of view). From the battery bank there should be one negative cable (probably going to the chassis of the vehicle) and one cable from the positive. The shunt should be installed in one of these two cables. The shunt is only needed if your regulator has the ability to track power usage and accepts the input from the shunt. I have purchased a small digital volt/amp meter to measure the output from my portable solar panels and also tell me how much voltage is in the battery. The meter also came with a shunt. I am at a loss as to wiring it into the caravan front boot. The solar regulator is in the front boot. I had a look at these on eBay and they look quite good. They are very much like the unit that I built and fitted to our bus a few years ago. I have fitted a selector switch on my one to allow me to read either the crank batteries or the house batteries. I just wanted an opinion if my project will work. I planned to alter the design of a solar power system, that instead of using solar power cell as charger I will use an ordinary charger with an ac source and a dc output. In my mind as soon as the ac power is on I will plug-in the ordinary battery charger which will charge the battery supplying the inverter. I will also put a shunt and a voltmeter. Can it be possible please help me , power cost in my country is very high. Not quite sure what you are wanting to achieve with this project. Why would you not just attach the charger directly to the battery bank? It is fine to charge batteries from two sources (ie solar and AC supply) – even at the same time. Thank you very much for responding, Of course I will attached the battery charger directly to the battery bank. What I am trying to drive out is for the power source of my battery charger which is the ac power of the inverter, instead of using the solar cells as the source of my charger. So if in your opinion it is fine to charge batteries from two sources (ie solar and AC supply) I think my project will be fessible, my problem now is how to have a guaranteed inverter, a 3,000 watt inverter, we have here in the philippines made in china but i’m not sure of its performance and life of the unit, can you recommend me one. thank you and more power. Hi – Now I understand where you are heading with this (by the way, your English is very good, it is just my understanding that was at fault). The problem with what you are proposing is with the losses in both the charger and the inverter – at the very best these will be about 95% efficient. This means that you will lose 5% on the inverter and another 5% on the charger. It will therefore take 10% more out of the batteries (to run the inverter and charger) than you will be able to put back with the charger. This will not work (for long). It is simply not possible to charge batteries from an inverter running from those same batteries. Even if everything was 100% efficient (not possible) you would still only be able to put back into the battery the exact same amount of energy that you take out. Solar panels work by collecting energy from the sun and using this to charge the battery. following you guys on your travels, hoping to do similar in NZ. I have 400w of solar and just putting in 4 x 130 amp 12v batts to end up 24v in bus. To add batt monitor and shunt to negative cable would 200amp shunt do the job or ?? Was thinking shunt to bussbar to chassis earth. On the other one pos + cable a 400amp fuse to buss to distribution box. Any suggestion’s would be welcome. Yes a 200amp shunt is normally fitted to a battery monitor. Take care – there is a second specification that must “match” the meter. This is the ratio between current flowing and voltage produced – eg 200mv @ 200amp. If this ratio is not correct for the meter you will get strange readings. The shunt produces a voltage (very small) in proportion to the current flowing through it. The meter connected to the shunt is actually measuring VOLTAGE – but because the voltage produced is proportional to the current, it can deduce the current flowing. A common shunt is 50mv @ 100amps – in this case the meter needs to double the mv (millivolt) voltage reading to display current. I normally look for shunts that do not require this – eg 100mv = 100amps. Jaycar electronics sell a very nice ammeter that comes with a shunt to match. Be sure the shunt “sees” all current – to do this make sure there is ONLY one wire on the battery negative terminal – this wire should go directly to the shunt. How do you test “Maintenance-Free” batteries to ascertain if still functioning well? if 12V Batteries falls below 6V is it possible to have them revived again? I would suggest a reasonable way to test a sealed battery would be to fully charge it then allow it to rest for a few days. The terminal voltage should provide a good indication of the self discharge rate. The other thing to do is to use a load test. 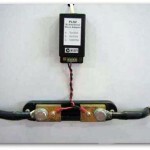 This is a device that places a variable load on the battery and plots the terminal voltage. Most auto-electricians have these devices. The ability to “revive” a excessively discharged battery very much depends on the battery chemistry (what type of battery) and how long it remained in the discharged state. AGM and GEL batteries are more likely to recover than flooded batteries. Depending on the capacity, you should be able to have the current from the new inverter pass through the shunt. This will allow the battery monitor to take the inverter current into consideration when displaying SOC. At full capacity, the inverter will draw about 160amps – make sure the shunt can handle this before connecting. It is also possible to replace the shunt with a higher capacity one (they are not very expensive) so long as the shunt ratio is the same. I would suggest checking with Redarc – I have spoken to their tech staff in the past and they are very helpful. 2. Overload – the circuit is carrying more current than the rating of the fuse. From what you describe, I suspect the second reason in your case. 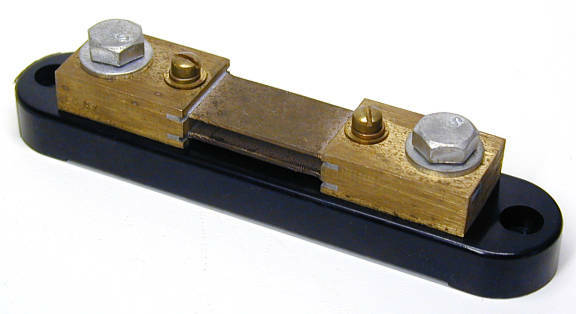 Automotive blade fuses are not good at carrying more than about 15 – 20amps. They tend to heat up and often melt. You do not say what size the solar panels are – for arguments sake I am going to guess at 100w each (total of 500w). at 12v 500w of solar can produce (in ideal conditions) about 41 amps. However, the batteries will only accept the amount of current that they need, so this could most of the time be limited by the batteries and the regulator. It is likely that after the batteries are discharged (say over night) you could see well in excess of 20amps flowing through this fuse. Alternately – this fuse also supply the various loads (lights and appliances) – it could be that you are drawing more than 20amps? Firstly, it is important to understand that a fuse has an important job to play – it protects the circuit and in particular the wiring. It should be sized to prevent an excess of current from flowing and overheating or melting the wiring. So you must first determine the size of the wire in the circuit – if it is large enough, you can change the fuse holder and the fuse to a larger size – or replace it with a DC circuit breaker (Jaycar electronics have some ok ones). If you use a fuse, I would suggest the large blade fuse holders are ok (about twice the size of an standard blade fuse) – Supercheap Auto carry these. If you can tell me the size of the panels, I can tell you what size fuse or breaker to use. Have you ever experienced strange readings with dc to dc chargers? I have a powertech 40amp charger. Connected via the shunt (beg side per amp meter instructions) it claims it is drawing 9 amps off….that is even with the + side disconnected. When charging it measures 2.4 amps as a draw…independent meter reads the same as a charge…I am not even sure how this is possible. Other chargers work and show on the meter as a charge…just the dc to dc shows incorrectly lol. Without seeing the setup it is hard to say, but I suspect it has something to do with the shared earth??. Shunts don’t lie, it will be reporting the current passing through it – it is just not possible for it do do other wise. If the shunt is wired correctly (ie here is ONLY ONE wire going from the battery terminal and that goes to the shunt – and all other wires are on the OTHER side of the shunt) then it will be telling the truth. Please let us know what you discover.